Critics say that they have been good at analysing what has happened in the past. But, when it comes to future, their predictive power has been stunted. Their failure to predict the global economic crisis of 2007-8 has been an often quoted instance. The present foreign exchange crisis which Sri Lanka is undergoing today is another. The economists at the Central Bank have been blamed for the crisis not only by an ex-Minister of Finance but also by a former Governor and a former Deputy Governor of the Bank. Contrary to what many seem to believe, the present crisis had been predicted as early as 2011. All previous publications of the country’s independent think-tank, Institute of Policy of Studies or IPS, had drawn the attention of the government in power to the need for fixing the oncoming economic crisis in its State of the Economy reports released from 2011 onwards. The latest added to this series has been the Sri Lanka State of the Economy 2018 released last week. In all these reports, IPS, working under the constraint of being a Government-owned think-tank, had politely but very strongly warned the Government of adverse consequence which the country would face if no urgent remedial actions were taken. In its report for 2011, IPS had warned the Government of the risk associated with commercial borrowings to fill the foreign exchange gap created by high local demand for imports and other foreign services. The report for 2012, while recognising that infrastructure projects are useful to lay the foundation for economic growth, had emphasised the need for introducing the economy-wide reforms in order to come out of the ongoing economic crisis. The report for 2013 was from a different perspective. While still maintaining that economic reforms are needed, it had critically analysed the state of the economy from the point of getting snared in what is known as the ‘Middle Income Trap’. Once a country gets into this trap, it cannot maintain its growth in competition with its peers because it no longer enjoys the benefit of cheap labour. It cannot move up either because it does not have the modern high technology to compete with rich countries. IPS had warned that if no reforms are introduced, it was inevitable that Sri Lanka would get into a serious economic crisis in the years to come. The report 2015 had delivered a strong message to the Government that came to power in January 2015 that unless it would concentrate on fast-tracking economic reforms, the country would inevitably face dire consequences. The State of the Economy reports for both 2016 and 2017, released after the present Government came to power, had emphasised the medium term challenges which the Government would be facing in its attempts at fixing the economy. The foremost of them were the slowing of the export growth, overhanging of external debt, low foreign direct investment flows and rising dependence on foreign borrowings to build foreign exchange reserves as well as gain capability for servicing the maturing external debt. The needed policy reform, as the report for 2017 had outlined would be ‘some unpopular belt tightening measures’ and implementing ‘a set of painful policy adjustments to reverse the steady deterioration of Sri Lanka’s export competitiveness in international markets’. I also in my regular articles in this series warned the Government of the impending economic crisis from around 2012. These articles were addressed to both the previous Government and the present Government. However, the response that I received was the display of a lukewarm attitude to the economy. What it proved was that an economist can take a horse to the water but would not be able to make it drink that water. 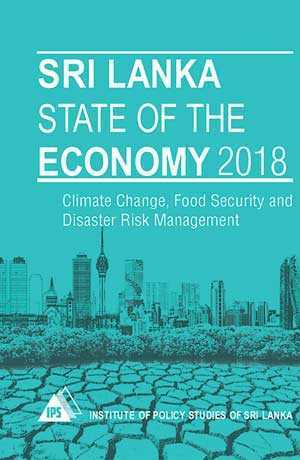 The Sri Lanka State of the Economy 2018 has been released by IPS in this background. All the previous reports had been prepared under the direction of IPS’s Executive Director, the late Dr. Saman Kelegama, a fiercely independent economist. The present report has been prepared under the direction of his successor, Dr. Dushni Weerakoon, who had been mentored by Kelegama when he was its ED. Weerakoon has demonstrated in this report that under her leadership, IPS would continue as an independent think-tank without compromising its high ideals. Every IPS report has a theme and the theme of the Report 2018 has been ‘Climate Change, Food Security and Disaster Risk Management’. All these are critical issues faced by Sri Lanka in the present background of deteriorating economic conditions. A country can think of taking measures to fix climate change only if it does well on the economic front. Climate change is a global issue for which all the nations will have to be united to find solutions for it. However, if the domestic economy of a country is faltering, it will have to first fix that issue before turning to climate change. Given the present situation in Sri Lanka, it is natural that the country would choose economy instead of an unseen global issue like climate change. However, that global issue has a bearing on the prosperity of Sri Lankans in the long run. For that, a proper marriage between the economy and climate change is needed. IPS 2018 is an attempt made toward that direction. Hence, the future projections of climate patterns show that Sri Lanka’s wet regions will become wetter and dry regions will become drier showing a polarised weather pattern. Therefore, it is necessary to take proactive measures to avoid catastrophes in this area in the future. Food security and disaster management are pressing domestic issues. Yet, they are highly related to changes in the climate. Hence, all three come together and have to be addressed simultaneously. Among key sectors, agriculture is likely to face the impacts of climate change most, says IPS. While the subdued performance of the domestic subsistence agriculture would bring in severe shortages leading to food insecurity, the export agriculture would suffer from low output and its consequential corollary, low performance in exports. Both will affect the country’s balance of payments adversely. Low domestic food production will require Sri Lanka to fill the gap through imports creating an unplanned drain of its foreign exchange earnings. This will also cause immeasurable miseries to rural farming population which is already living from hand to mouth. It will entail a serious social and economic cost on Sri Lanka. On the other side, low performance in export crops will reduce foreign exchange earnings compounding the issue. Since Sri Lanka’s external financing still depends pretty much on the foreign exchange earnings by this sector, any unanticipated decline in foreign exchange earnings will be highly critical to Sri Lanka. The IPS report has made a detailed analysis of how these two sectors would make Sri Lanka vulnerable to an impending economic crisis through climate change. The bottom line of the IPS report is that proactive policies should be taken by Sri Lanka to avert these adverse consequences. It is therefore, necessary to act today when the issue is still at a manageable level. The necessary policies, according to IPS report, are numerous. It has recommended that climate change issues should be made a part of the national economic policy framework so that all economic policy measures which will be implemented by Sri Lanka will give due recognition to them. It will enable Sri Lanka to have a coordinated approach at climate change. It also involves a suitable adaptation strategy to mitigate the risks arising from climate change. In the case of food security, IPS has recommended the introduction of farming practices that are suitable for more arid climates. It will also save water which is now a scarce input for farming. This was a point I raised in my previous article on the subject under the title ‘Resolving the paradox of rice-poverty amidst plenty: increase yield, eat less and divert surplus to industry’ (available at: http://www.ft.lk/columns/Resolving-the-paradox-of-rice-poverty-amidst-plenty/4-658623). It was pointed out in this article that paddy farmers have to use about 2,500 litres of water to produce one kilogram of rice and about 1,000 litres of that usage get wasted through evaporation and percolation to the earth. But with erratic rainfall systems, water becomes scarcer and Sri Lanka should find varieties of paddy that war drought resistant and adopt farming practices that use less water. Unless this is done on an urgent basis, Sri Lanka’s paddy farming and paddy farmers will not be sustainable. IPS report has provided a detailed analysis of China’s Belt and Road Initiative or BRI from the point whether it would be a sustainable economic partnership for Sri Lanka. Economic relationships which Sri Lanka had with China date back to many thousands of years. Sri Lanka had exported elephants, ivory and spices to China while importing silk and other fine clothes from that country. After Sri Lanka’s independence in 1948, these relationships were renewed through a historic Rubber-Rice Pact in which China would buy Sri Lanka’s rubber at premium prices while supplying rice from international markets at a discount. This was a blessing for Sri Lanka in 1950s, 1960s and 1970s when the country was facing a severe foreign exchange crisis. In more recent times, Chinese loans at market rates and investments have helped Sri Lanka to build its infrastructure facilities. These infrastructure facilities have been criticised on the ground that they are not economically and financially sustainable. Hence, in the new BRI, it is necessary that Chinese investments should be attracted by Sri Lanka by paying careful attention to their economic, financial and environmental sustainability. IPS report has emphasised on these requirements. There are five major objectives of BRI, as highlighted by IPS. First, there will be policy coordination among the nations participating in the initiative. It will not only avoid conflicts and delays but also help countries in the programme to get the best out of economic policies. Second, people along the new belt and the road will be digitally connected enabling them to use advanced technology for commerce, interactive communication and exchange of views. Third, there will be financial integration. Fourth, trade would be conducted among the belt and road nations without impediments. Fifth, it will enable people to have person to person contacts. This objective along with digital connectivity will help people along the belt and the road to develop as a unified group of Homo sapiens. According to Oxford historian Peter Frankopan who has documented the history of the old Silk Road under his 2016 book titled Silk Roads, religions, faiths, philosophies and arts spread through the old Silk Road from China to the West. IPS has documented a number of benefits which Sri Lanka could derive through BRI in the form of increased trade, tourism, investment and so on. Overall, the IPS report on the State of the Economy 2018 is presented in a readable manner with a host of infographs to illustrate its points. I see a weakness in the report because it is produced as a black and white document. But if it is printed in multicolour, it would definitely be more appealing to the readers.